In celebration of Labor Day, all weekend long we're excited to bring back our delicious Star Spangled Platter (packed with Hawaiian sliders, steak and teriyaki chicken skewers, pork ribs, jalapeño poppers, and onion rings) The Bomb Burger (a prime rib grind served with all the fixings) and our limited edition patriotic Mai Tai glass! Call (949) 722-1100 to book your visit or click here to reserve via OpenTable. By popular demand Tapua is returning to Billy's, and if you joined us for our 25th Anniversary Celebration, you know what your in for! 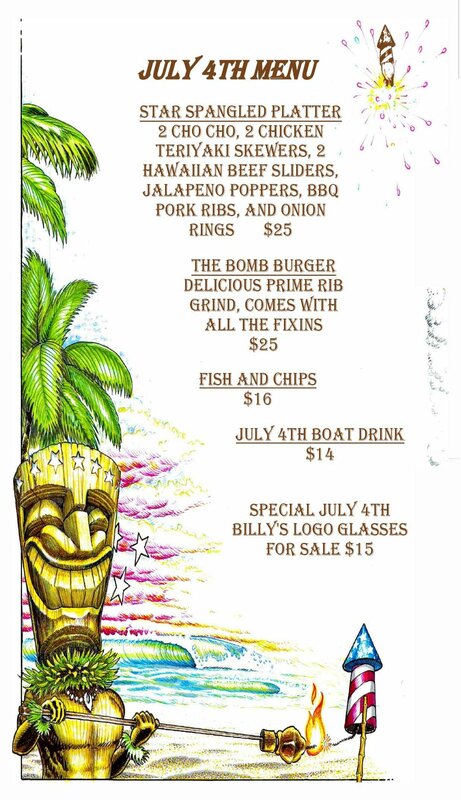 Escape to Billy's at the Beach on Wednesday July 25th from 5-8PM for a special night of Polynesian entertainment, featuring traditional live music, hula dancers, and a sunset torch lighting ceremony. Seating nearest the action will go quickly; call (949) 722-1100 to book your visit or click here to reserve via OpenTable. Seating beside our floor-to-ceiling windows overlooking the bay go quickly, call (949) 722-1100 to book your visit or click here to reserve via OpenTable. Father's Day is Sunday June 17th! 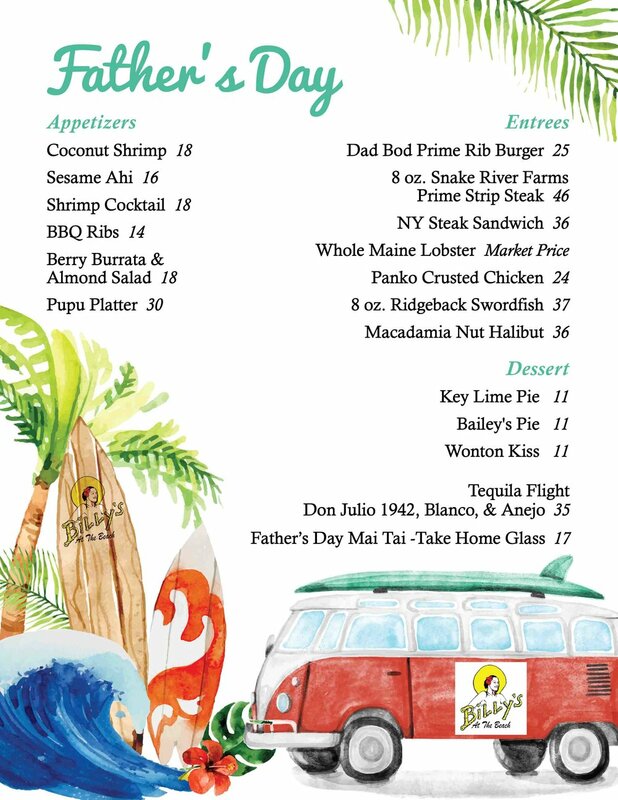 Come celebrate dad with our special Father's Day menu all day long, brunch from 10AM to 1PM, or lunch from 10AM-1PM. We're also excited to be offering a special edition commemorative glass, which along with a mai tai is yours to take home for just $17! Tapua is returning to Billy's, and if you joined us for our 25th Anniversary Celebration, you know what your in for! Escape to Billy's at the Beach on Wednesday June 27th from 5-8PM for a special night of Polynesian entertainment, featuring traditional live music, hula dancers, and a sunset torch lighting ceremony. Bring your thirst, we've revamped our tropical libations! 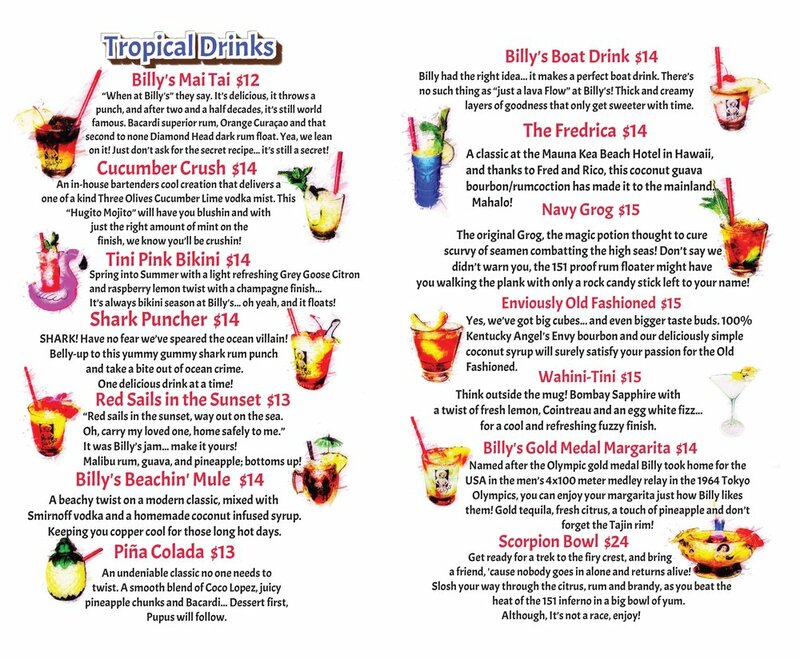 Old favorites remain—we're lookin' at you, Mai Tai—but on your next visit, be sure to try the fun Tini Pink Bikini, a refreshing Cucumber Crush, or the jaw-some Shark Puncher (just to name a few). In celebration and in remembrance of our fallen servicemen and women, we're proud to be offering a special Memorial Day Pupu Platter all weekend long! To reserve seating beside our gorgeous floor-to-ceiling windows overlooking the bay, call (949) 722-1100 or Click Here to reserve via OpenTable. Mother's Day is Sunday May 13th! Come celebrate your biggest fan with our special brunch menu (or regular lunch menu) set to the island rhythms of Matthew Akiona! Seating beside our gorgeous floor-to-ceiling windows overlooking the bay go quickly. 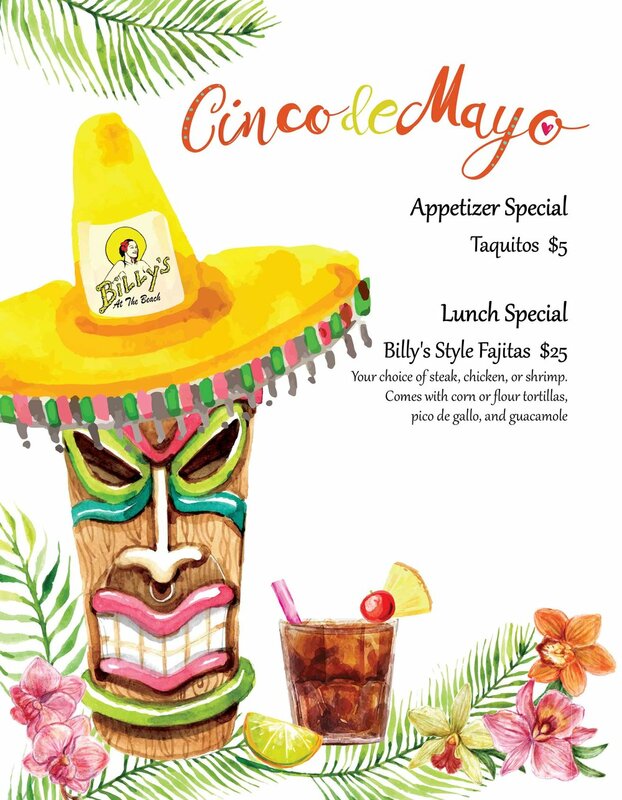 Cinco de Mayo is around the corner, come celebrate Mexico's 1862 victory over the French Empire with appetizer and lunch specials we're offering to mark the occasion!